Body Machine Fitness and 22KILL come together for the check presentation. With the tragedy of suicide featured in recent news, awareness and prevention are even more urgent. We are gratified to contribute to such a worthy cause. 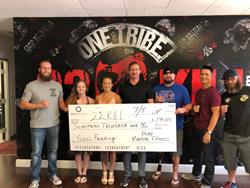 Body Machine Fitness, a world-class fitness studio, today announces its Plano, Texas studio raised more than $25,500 to benefit 22KILL, a nonprofit that raises awareness of the veteran and first responder suicide epidemic plaguing the country and educates the public on PTSD and other mental health issues. The North Texas community was invited to participate in the #BMFx22KILL Challenge from May 22-June 22, 2018 at Body Machine Fitness. The fundraiser offered special classes incorporating the signature 22KILL Push-Ups, as well as custom workouts created especially for adaptive athletes. Body Machine Fitness donated $22 per member participant in each 22KILL Challenge Day class. Additional donations were accepted throughout the entire campaign. A 50% match was donated by Terri Maxwell, CEO of Share On Purpose, Inc. and Promote On Purpose, LLC. As a Grand Finale, Body Machine Fitness held a one-hour long push-up challenge where friends and family of the participants donated per push-up completed in that one hour. Donations ranged from .10¢ - $2.00 each. The simple strategy was to aim for only doing 5-10 pushups per minute, and resting the remainder of the minute. To learn more, please visit http://www.bodymachinefitness.com/22KILL. Founded in 2017, Body Machine Fitness is an instructor-led, immersive workout experience driven by a club-like audio and lighting atmosphere. The one-hour full-body strength and conditioning workouts are designed to serve all fitness levels from beginner to elite, while providing world-class equipment, spa-like amenities and smoothie bar offerings. The entire workout experience, including the synchronized electrifying audio, soundtracks and light show, are customized daily to keep members engaged, energized and deliver maximum results, while ensuring the safety and well-being of its members. Founders Margaux Phoenix, Jeremy Soder, and Pete Stickney are physical fitness experts and enthusiastic supporters of the community in Plano Texas and beyond. Learn more at: http://www.bodymachinefitness.com. 22KILL, a 501(c)3 nonprofit organization, started in 2013 with a mission to raise awareness to the suicide rate among veterans and first responders, educate the public on PTS and other mental health issues, and focus on suicide prevention through empowerment. 22KILL offers a variety of programs and resources for all service members. These programs provide many forms of traditional and non-traditional therapies for both mental and physical health, serving veterans, first responders, and their families. Learn more at http://www.22kill.com. The fitness event raised $25,500 for the North Texas non-profit.